As the time is coming around for students across the country to head back to college, many are still deciding on which laptop they should purchase. Last year we compared the Dell XPS M1530 and Apple Macbook Pro 15, which sparked an intense debate. This year, two popular 13-inch models are Apple’s new MacBook Pro 13 and Dell’s new Studio XPS 13. There’s a lot of similarities in terms of hardware between the two, however a different set of features and the included operating system sets them apart. To help you folks decide which machine is right for you, here are two charts provided below. The first compares the Apple and Dell in terms of features with a total score. For the second chart, we picked the base model of the Apple MacBook Pro 13 and then configured the Dell Studio XPS 13 to match the same specs to see how much the price would differ. Take a look and let us know what you think! For the prices, the totals were the cost shown after configuring the machine straight off Apple.com and Dell.com before taxes were calculated in. Both companies are offering free shipping which is a plus. Dell is offering the next generation Operating System, Windows 7, for free. Apple will charge just $9.95 for those who purchased a qualifying computer after June 8th, 2009 to upgrade Snow Leopard. Even with those details set aside, the Studio XPS 13 totals in $273 less than the same configuration for the MacBook Pro 13. Plus if you are willing to shell out more cash, there’s a lot more features Dell seems to offer with their model than Apple does. What are your thoughts on this? Update: Since publication, we have updated a few elements of the chart and article. These changes include: Apple OS X Snow Leopard Price is $10, not $29 for purchases of MacBook Pros since June 8th, 2009. The screen resolution is WXGA for 16:10 aspect ratio, meaning a 1280×800 resolution, not 1366×768. The Studio XPS also has a multi-touch trackpad, similar to the MacBook Pro. i’m hoping tha apple will throw in snow leopard for people who bought their macbook pro after a certain date! that would be wonderful apple! hope you are listening! i would always stick with mac, no matter what. even if both computer would run the same OS, because the build quality of mac products are awesome. anyways, i hope apple come up with some new technologies soon, because there supposed to be numero uno. Dell is the best.mac book pro is not bad but apple platefome is difrent mac bookpro is not strong laptop. Mac bookpro is very expencive book . Thanks for pointing that out, I’ve updated the article accordingly. It seems to me with the student discount, and with the free ipod touch Apple offers with it right now, the price difference is not at all that much. Plus dealing with Dell service, for me at least, has been nothing less than a nightmare. Dell also has the Educational Discount. They have 7% additonaly off the deals already on the site. So that’s pretty good. And keep in mind you have to pay up front for Apple’s iPod Touch. and afterwards they give you a rebate of $230. that is just enough for the 8GB iPod Touch Model. You can get a 16GB or 32GB if you want, but you’ll have to pay the difference of couse! And I have had a tell vostro for a year or two. It works perfectly. I got mine for way less than a macbook costed when i had bought it. it had an issue about 6 months ago after I dropped it. I called Dell they let me send it in and fixed it completely within a week. So i’ve been fairly happy with them. I had a vostro too. The optical drive failed. The tech guy told me how to remove it and I couldn’t. So they sent me a box to mail it to Dell. Weeks later, my computer was returned unrepaired with a note stating they’d send me the piece whenever they got it and I could fix it myself. I sent a complaint to the BBB and another to consumerist.com, which covered it. Eventually I got my money back from Dell, bought the Toshiba I’m now using for 250 bucks less, and I’d buy another. I don’t mind paying the extra 70 bucks to get my daughter the ipod touch she wants. I’ve had other problems with Dell, and I will never buy anything from Dell again under any circumstance whatsoever. The price difference ends up negligible at best, and I get to try this Mac I’ve heard so much about. Actually I used one for a while at the Apple store, and at this price point I think it’s certainly more interesting than another four hours calling people in India who have no idea what I’m talking about and no authority to help me. I agree about the $350 price difference being a big deal for the features you get, however not so much regarding the support. We’ve all dealt with Tech Support for many different companies. There are both useful and useless reps that pick up your call anywhere you go. I’ve had both good and bad experiences with Tech Support whether it was a call placed to Bangalore, India or Texas, USA. I have a Dell XPS M1530, when I had an issue with it the first rep that picked up wasn’t helpful. After calling back a few minutes later another rep picked up and agreed to entirely replace the computer due to over heating since the fan wasn’t kicking in. I got a brand new replacement, not a refurbish. I complained to Apple about my screen not staying shut on my MacBook when I tilt it past 45 degrees vertical…they sent me a MacBook Pro as a replacement…I went a total of 17 hours without a computer…yeah I wouldn’t knock that kind of service. Not to mention the screen thing could hardly be considered an issue. Last I looked, 350 minus the 329 rebate of the ipod touch was 21 bucks. That is indeed negligible. In fact, I’m getting a $99 rebate on the printer too. I certainly did not wish to stereotype people from India. I it included at least one call to someone with an American accent. Sorry, I submitted that too soon by mistake. But I certainly do not attribute the miserable service I experienced from Dell to the national origin of its employees. And it’s a 229 rebate-pardon me again. I previously owned two dell xps laptops. The xps m1210 and the xps m1330. What i noticed about these laptops is that they are cheaply made. I recently made the switch to the new macbook pro 13 inch. All i have to say is WOW! This is what i call a laptop. The main reason i chose to go with the apple instead of the new dell studio xps is because with the apple i can run the mac os, windows os and linux. With the dell i was able to run the mac os but it was very sluggish. Overall the laptop just feels well made with the aluminum chassis. I bought this laptop for 1499.00 and a free ipod touch you can’t beat that deal. Don’t get me wrong the dell xps line is good but you can’t beat the macbook pro series. Just take at the benchmarks and performance of both laptops and the macbook pro 13 is better in every category. Do you have any links to the articles where they bench-marked each laptop? I’d be interested to see comparisons of the two! I usually go to http://www.notebookreview.com for benchmarks. I purchassed the Dell Studio XPS Studio 16 with a core duo 2.66, 3mb front side bus, rgb led display, blueray (read and write) and a 1 gig ati video card. Yes the build quality isnt that great but the mac pro isnt that great either. The older Dell Inspirons like the 7000 were built like a brick house. All notebooks these days are built flimsy whether its a Dell or Apple. Hp is the king of flimsy. I know the build quality because I work on notebooks. You know how flimsy a notebook is when you take them apart not just looking at them. Now if your judging a Mac Book by apperence then yes it “looks” more sturdy, however have you ever pulled one apart lol. Its a joke its no different then the Dell XPS. Big hunk of plastic and aluminum period. What really matters is performance. Both Apple and Dell depend on preference. I do love Apple for its music and video capabilities dont get me wrong they are number 1 in the industry. However for what you get from Dell as opposed to Apple I chose the XPS hands down. I already have an iphone so the ipod touch wasnt enough to excite me. What excites me is the performance of the XPS. Its smooth and relible. Not to mention the RGB led display!! Thats what won me over. Apple makes fine products and it would be my next choice. However I settled for the Dell Studio XPS 16 and I dont regret it at all. I guess nobody told Robert that the UNIBODY MacBook Pros are milled anodized aluminum and far from flimsy. You must be blind to open up a generic notebook and a MacBook Pro and not see the ENORMOUS difference. The other notebooks are like sandwiches but the contents are all sliced up and stacked in the most arse-backwards way. With the MacBook Pros everything is placed neatly and only takes the removal of the lid (8 screws) to reach EVERYTHING! You can replace the screen without removing ANY other parts, the same is true for the optical drive, hard drive, ram and even, yes, the MOTHERBOARD! Face it, Apple’s engineers are the NASA of computers whereas the other guys are exactly what they are…second rate. And I know what you’re thinking, “you just have to remove the bottom part of Dells to do all that too” NOT! The lid to the MacBook Pro slips off as easy as the battery in most notebooks! Others get tangled in the jungle of wires and plastic that looks like it’s been Jerry-rigged. Working on a MacBook Pro is the greatest joy any tech such as myself will ever face in that line of work. Yeah. The Unibody design on the MBP is actually better then anything else hands down, but I wouldn’t say the SXPS 16 is anywhere near bad either. As for getting to the guts of the SXPS 16 versus the MBP it may still lag behind a bit, but there is mainly one panel that accesses everything too. But I won’t lie, and you wouldn’t either if you saw the RGBLED, its a beautiful screen that is perfect especially for photo-editing. Let’s not waste time here giving credentials or my list of computers owned in the past. I am a consultant for small businesses & corporations of all shapes & sizes. I am NOT a fan boi, nor do I drink any KoolAid of ANY kind (it’s 10% juice anyways). This is simply a guy chiming in who DAILY sits in front of no less than 30-50 mixed brands of Windows-based computers in the global retail market, where downtime is NOT an option. Every day is a different company, different client. It’s like living in a pressure cooker, to say the least. I currently own the new 13″ MacBookPro (mid-June), & support ALL networks & end-user clients with this simple machine. I say simple because this time around, I ordered a base model with ZERO options (no extra RAM, no extra software, nada). My last 17″ MBP (2007 built to order, currently in use for my wife’s full-time graphic design career) was not the best portable laptop, but dead reliable. About the same time I ordered my MBP, I purchased 4 additional units with identical configurations to mine, then deployed these to ALL new-to-mac users. One guy is CEO of a thriving company. One is a seminary student obtaining his PHD. One is my 65 year old mother. One is a missionary. ALL have reported that the past 2 months have been flawless, including me. Sure, I crash Safari on a regular basis, but rarely do I find it necessary to reboot, or get hung up with any hardware drivers, battery life is stellar (usu 4-6 operating hours before I get the “on reserve” warning) & Apple support is helpful 90% of the time (10% reserved for the rare occasion I bounce to an overseas call center & treated like I don’t know how to turn on a computer). There is no perfect computer -or- company. Apple is in the news and an EXCELLENT marketing company. But facts are facts, & the fact in this matter is that Apple strives to put out quality SOFTWARE by selling computers that run their software best. Dell puts out machines based on the lowest common denominator, & only recently have they recognized that if they want to continue sales, they will have to pony up & get some reliable hardware sourced & sold. I often debate whether or not to put up a daily running commentary on the absurd amounts of time I waste with their company, from phone support, 3rd party dispatched field technician support, really, it’s comical in a way that all the food put on the table & clothing for my family comes from the Microsoft + Dell marriage. Wrong. Is it too much to ask for a simpler way of depending on technology to get REAL, actual work done? Apparently so. Anyone still reading, I’ll sum this up quickly: by purchasing the Apple, you can get a friend or even hire a tech to install Windows on it, then you have two laptops for the price of one, & you will quickly see that by spending less time frustrated with your computer you may actually become a productive student/member of society. A lofty goal? Perhaps. Again, I am ONE guy sharing my experience with the above comparison/review in mind. I see the working publics frustrations on all accounts of technology & what else can I do but suggest this: spend less time complaining & more time working by trying a different computer. Step out of the “comfort zone” of what you have either been taught or used for so many years in WindowsWorld. If the experience doesn’t work out for you, great! At least you learned something new & may have even been challenged along the way. If nothing else, buy an Asus or Lenovo! Why? Ask my intern who after having helped me for the entire summer, listen to my suggestions & experience of buying most things Apple, & what does he do? Buys a $1600 DELL that took 2 weeks longer to arrive than originally stated (whereas Apple consistently under-promises & OVER-delivers on ship times), takes it out of the box, only to find a major key popping off (not fixable without replacing keyboard; cheap hardware) & the bottom of the case loose. A lemon? Maybe. Convenient with college starting Monday? A shame, really. Yet he was uncomfortable in switching to anything other than what he has grown up with (Dell desktops), despite having to hire me to fix them more than once (yes, I am a certified, competent tech; issues were either hardware related or WinX typical flakiness). I hope his new Dell survives the first semester. i just started a job and i would like to buy a lap top. i ws planin to buy the apple mac book pro.13 inch..i am gtin a discount too..the thng is i need a lap top 4 office use as wel as for personal use..wat would u recomed n apple or ne other?? Erm. One question. . . what would you say would happen if Apple had as large a share of the PC Market as say, Dell? Would you say their service would suffer? What about being a bigger target to hackers? Do you suppose their quality would suffer? I had to laugh at this article because one of my roommates got a Macbook Pro 13 inch and I got a Dell Studio XPS 13. Let the gloating commence! I’ve owned both Apple and Dell products. If you are fortunate enough to live near an Apple store the Genius Bar is great. Phone support not so much. If you look at the table above, where Dell wins theres a lot more meat. Apple gets a big plus for battery life – but after that their wins are mostly meh. For the things that will really matter – like video speed, drive RPM, and Dell’s significantly better video SLi video card option – Apple falls short. And don’t even think about an 8GB memory upgrade on the Mac. For that Apple will charge you a cool thousand dollars — twice what Dell gets. After 1-2 years when your dell system works at maybe 50% of its operational speed due to a whole host of windows based bugs, you will start to wonder why you didnt buy a Mac. I am currently typing on a dell XPS m1710 that has a tendancy to overheat, underperform and with a screen so loose it makes Sharon Stone look like a teenage virgin. I have played with my mates macbook pro and i have drooled over them in the shops, now that my XPS is coming up to 3 years old (I paid £1670 in March 2007, top spec: 2.16ghz, 2gb ram, gt7950gtx) im looking at a purchasing a 13″ macbook to use as a net browser and as a base for music production (im a DJ and want to record my mixes using a stable program such as garageband). My Dell XPS cant record music because there is a piece of hardware that emits a bleeping sound not too dissimilar to morse code that the recording software (Audacity/Soundforge) picks up. I cannot turn it off nor can i edit it out, so therefore it basically renders this very expensive laptop usless for one of its main purposes (did i mention the screen was loose?). In short, Macs are built to work. Im fed up with the constant maintenace and nursing Vista requires, not to mention the shoddy build quality of the Dell. I can safely say i will be purchasing a 13″ Macbook Pro, goodbye Dell. Oh and how could i forget!! the battery was reduced to an hours life after the first 12 months. It now needs replacing completely and lasts maybe 5 minutes without the power cord. I believe both systems are equally good. I however like the Apple Macbook Pro for reasons that are more personal than anything. First the aesthetics are amazing and many of the features of the OS can’t be found anywhere else. Overall the Apple Macbook Pro goes more along with my personality. The Dell XPS is a great system too and in many ways more versatile than the Apple laptop but I want the Apple. I would appreciate the feedback. In other words which is more important: the higher GHZ or the larger MB video card. I use Adobe graphics products like CS4 web design. Also, how soon before the 256 video card will become obsolete? Will everthing be 512 MB video card in the near future? While I like the Mac this 256 MB video card seems to be a real deal breaker not to mention a $$$$$$$$$$ issue (to go to a 512 MB video card on a mac pro is a significant price difference and you can not upgrade the video card at a later date on a mac pro …. Please enlighten! What you have to remember is the MacOS is built to perform on the Mac! This way it is optimized 100%! If you have two machines with equal RAW power, you will see that in every instance the one running OS X will beat the pants off of Windows. OS X is just lighter and not to mention unix-like! You will get the same if not better performance using Adobe products. I actually just purchased the Studio XPS 16. I got mine with a 2.53GHz Core 2 processor with ATI Radeon 4670 1GB video RAM. If you are gonna do any heavy editing or gaming, I would recommend going with the XPS 16, also you can get an RGBLED screen. Just shop around, you can probably find a pretty good deal on the Dell. I had an HP laptop which I gave to my son. I now need a new one and friends and fanily say spend more and get the Apple. 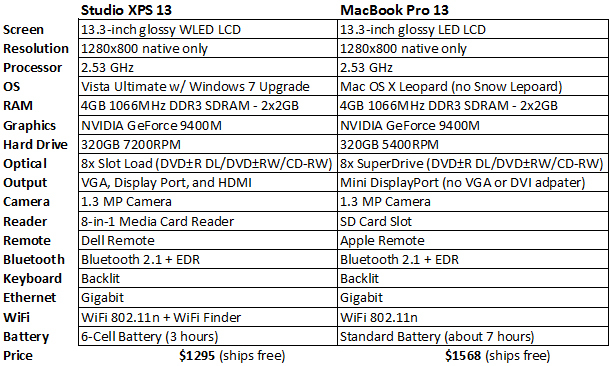 The difference between the Dell XPS 1340 and Apple Macbook Pro 13″, both with extended warranties etc is about $800. My grown kids say pay for the Apple but I’m torn; it’s alot of money. Can anyone help me make a decision? Is there another laptop that I should consider? Please help! you know now, the difference in price is a lost less than 800 bucks. just configure them online. the thing that will make the mbp shoot up in price is if you buy more memory or hard drive. Can you get the macbook with a DVD reader? All Apple portables come STANDARD with drives capable of reading/writing up to dual layer DVD’s. In other words it will burn and read all DVD’s. 1)can I bring it into my Apple store and have them fix it? 2)Can I get one quicker? Dell is saying I can’t get one until Dec. 31st or so. 3) My dells are always slowing down with who knows what. Cons – apple is more expensive and I don’t think I need an IPOD touch but I do have a student available if I need one to get a discount. 4) The unibody MacBook has a great integrated battery that will last somewhere around 5 years before needing to be replaced. All Apple notebooks can have the hard drive, memory, and optical drive upgraded. i’m torn between these two… but, i think i’ll lean towards what both can offer with regards to battery life. my question, if i configure the dell almost exactly as the apple, will i be able to milk 7 hours out of it too? i like the battery that doesn’t stick out of the laptop. i think the bigger battery is like that. some features in the above table are listed like “nvidia geforce 9400m or 9500m” as well as the processors. but i know the higher the spec, the more it drains your battery. also, the “t” processors drain more than the “p” ones? i think apple uses “p” processors. According to the above graph the NOMINAL results of the MacBook Pro are DOUBLE the NOMINAL results of the Dell…a chip isn’t going to make that much difference. And what you said is not always exactly true, it’s about efficiency, not the total processing power. The MacBook Pro is not only as efficient but the battery is MUCH more efficient as well as MacOS X’s ability to power manage. As a matter of fact the MacBook Pro’s 7 hour battery only lasts about 3 when using Windows!! So the battery, in combination with the highly efficient chipset and operating system, makes the MacBook Pro the better choice as far as battery life goes. Not to mention the Dell battery will probably die in 16 months whereas the MacBook Pro is estimated to last 5 years before needing a new battery. thank you for pointing that out. for a minute or two after i have submitted my comment, i came to realize that i may have overlooked the second chart. does that mean that the apple will be dead like a brick after five years, since the battery is irreplaceable? whereas you can change the battery in the dell? not to mention if a new battery technology emerges. It is not irreplaceable, it is considered “non-user replaceable’ meaning once it dies, you take it to an Apple store and they will install a new battery. This is really nothing to fear at all, considering some people still use their iBooks from 1999 with as much as 30 minutes of battery life! Considering most common batteries, such as the ones in the iBooks, last for so long with SOME capacitance, it’s not impossible that the original battery may last in the MacBook Pro for much longer. Although I suppose it doesn’t matter anymore for the SXPS 13 as it has reached its EOL (End of Life)(Due to the fact it couldn’t support the new Intel i5 Processors[they are apparently making a new model to support it]) it is notable, although maybe not ideal, that you can always buy additional batteries which will allow you to extend your laptop’s life as long as you have additional batteries whereas you can’t do this with the MBP13. Really though NEV. 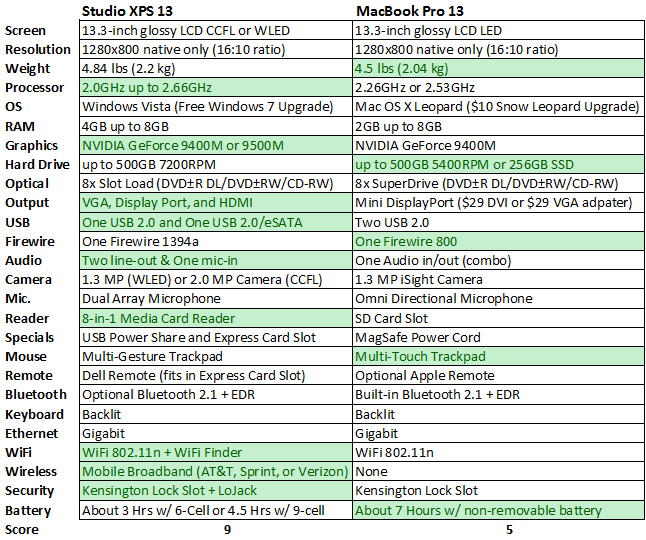 Sadly, comparing the SXPS 13 with the MBP 13 is a bit pointless as their uses vary. Whereas the MBP 13 is a beautiful blend of power + portability + battery life, the SXPS 13 was more aimed for those seeking more ‘power’ + portability, but with a more negligible battery life. So… really the deciding factor should be… what do you need or want out of it, and at what cost? And I’m done rambling. thanks. but now i’m more torn between the 2 since i was planning to use the apple with windows. OK well it’s your choice. I will point out that you can run Windows WITHIN MacOS (thus giving you back all that battery life) with software such as VirtualBox (free) VMWare Fusion, Parallels and such. Google these and decide for yourself if it’s what you need. whoa! i’m fairly new to macs. well, actually i’m absolutely new. and, i didn’t know about that. so using that, you can have the 7 hours back? but what if i run it in a dell, will it have the same effect? Run what in a Dell? OS X? It’s agains’t Apple’s User Agreement as well it is HUGELY difficult and problematic. Also the Dell’s batteries are not the super efficient type that Apple uses so no, you can’t expect the same results. I’m not guarantying 7 hours, it depends on how much memory and processor and screen brightness you’re using as well as other factors but I get a consistent 4-6 hours of work time on my 13″ MacBook Pro or 8 hours of web browsing. However, it IS more power-efficient than just running Windows normally so in a way yes you will get much greater battery life. i mean run VirtualBox (free) VMWare Fusion, Parallels and such in a dell. so that i can squeeze more out of the dell’s battery. btw, thank’s for the great info. These programs are to run WINDOWS inside of MACOS! Give it a search on youtube. It basically puts Windows inside of another window, it’s like a computer in a computer. In this way you can run both side by side. Why would you need to use windows? Can you do MS word, powerpoint, etc. in the mac environment? Dell also has a blu-ray option and mac doesn’t. susan There is an Office version for Mac, so yes, however there is also iWork which has better options and will perform better in MacOS X.
Blu-Ray is not yet practical as a form of writable storage media and is more suited simply for Media, such as movies. However if you DO feel a need to have a BR drive you can simply get a slot-loading SATA BR drive and install it in the MacBook yourself. Apple much prefers using NON-PHYSICAL media, such as digital-copies of Hi-Def movies and I’ve learned to appreciate this as well, it’s much better on battery and makes less noise, as well disks can easily become lost or damaged whereas if you deleted all copies of your movie you can simply re-download it for free from iTunes.